The Sheep is in "hidden union" with Tai Sui, bringing you great interpersonal relationship with everyone and best terms with people. However, ranking in the last quadrant in terms of luck among the 12 zodiacs in 2019, challenging times are ahead as unlucky stars are aplenty while there is only one weak positive star in your constellation. First and foremost, those who are engaged in the field of artistic creators will benefit from Hua Gai star (Artistic Talent) that will help in your personal development and information skills. Because it is an academic star, it implies strong learning abilities that can benefit your career if you indulge yourself in any kind of personal development. However, the bad side of this star will cause you loneliness and depression because of involvement in highly personal and lonely pursuits. On the downside, the influence of Tian Xiong star (Sky Warrior) will lead you to making enemies with your family members, superiors, counter arts and colleagues at work due to tendency in miscommunication. In short, it is a miscommunication star. More on the downside, the Bai Hu star (White Tiger) implies bloodshed, mishaps, injuries and accidents. Therefore, you will have to be extra cautious at all times when driving, partaking in extreme sports and engaging in high risk physical work. You will also need to pay close attention to water danger. The Bai Hu star may also cause you to maligned and estranged by villains. Strong gossips will run you down. Troublemakers are aplenty to give you unending headaches, therefore stay away from listening to people with regards to your investment portfolios and work related matters. If meticulous care is not taken to handle it, this will be a huge hindrance in your route to achieving success. Compounded with the influence of the following negative star, you are most likely going to suffer from injury that seems to be inevitable. What is more, you will be reduced to frequent crying due to the ultra-sadness Tian Ku star (Heaven Cry). This means you will suffer from mental anxiety, inner depression and stress due to continuous losses throughout the year. This is a year to be careful of calamities and mishaps, as there may be frequent problems at home. You are very likely to experience injuries. You can hardly get along with anybody. More worrying, your finances may sink into crisis and depleted by Da Sha star (Big Killing). If you are not careful, your mainstream income can be at jeopardy as a result of losing your job. To sum up, it will be a trying year in your career with financial losses and tumultuous relationships indicated. Health wise, you will need to pay more attention to health issues to prevent terminal illnesses. You are advised against attending funerals or visiting the sick in the hospital if possible, else misfortune will strike upon you. In terms of love luck, there is hardly any progress due to weak peach blossom. Using cures and enhancers will be vital to subdue unfavorable outcome and materialize favorable ones. Preparing to counter setbacks will help you stay on top of things. They have the power to bring negative issues or bad occurrences to an end and convert negative outcomes into positive ones, resulting in a lot of seemingly problematic obstacles becoming blessings in disguise. On an equally important note, you will also need to use the recommended enhancers to release the good luck. If you don't do anything about them, you will only let the opportunities pass. The luck activation practice is like creating new inroads to manifest. It has to be emphasized that changing your approach, thought, behavior, stand and attitude alone are considered as reactive and will not address bad luck or release any good luck. Bracing yourself mentally against any unfortunate events that may occur throughout the year without doing anything is the most unwise plan to do. The followings are the proactive measures to drive for a fruitful year. Fatal Star #5 Yellow - Display Chung Kwei Subduing Five Yellow in the SW.
Offend White Tiger (Neutralize Villain) - Carry along or display the Chundi's Fan-Mirror in the west (direction of relationship). Display the Three Fireballs in the south (direction of gossip). Career Boost - Display the Pigs Discovered Treasure at your work desk or in your living room. Carry in your work bag the Heaven's Flag Amulet to secure recognition in your work. Accumulate Money - Display the Wealth Absorbing Elephant facing your main door. Wear the Pregnant Dragon Pendant. 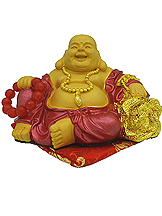 Prevent Dispute with others - Display the Red Robe Laughing Buddha in the southwest. Anti-Accidents/Injuries - Display in your car the 8 Immortals Coin. 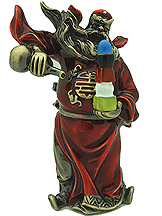 Health - Keep under your pillow or hang at the knob of your bedroom's door the Twin Wulou Amulet. Love Enhancement - Display the Nine Tailed Fox Amulet the door knob of your bedroom. *Business/Investment Luck - Display the Military Wealth God on Tiger at the cashier, director's desk or with investment portfolios. *Academic Success - Display at the desk the Academic Ornament.